“I will bite off more than I can chew and just figure it out along the way,” he said. So when the 28-year-old announced his Arizona CrossFit affiliate would begin farming, few people were fazed. “I didn’t think he could make Fury happen,” she joked while sitting on a stack of wooden plyo boxes in the corner of the 15,000-square-foot facility that is CrossFit Fury. The affiliate, which Egyed opened in 2008 with 2,600 square feet, has grown to about 500 members. In those six years, the four-time CrossFit Games competitor has introduced various offerings to the Goodyear, Arizona, affiliate, including yoga and ballet classes, to name a couple. And today, the affiliate runs a farm on about an acre of land, which coaches seeded with cabbage, Romaine lettuce, golden beets, red beets, onions, two varieties of carrots, as well as parsnips and spinach. 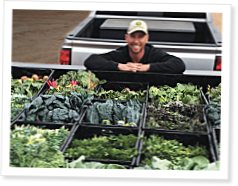 The long-term goal for the farm is to produce those nine types of produce on seven acres of land. Such small farming can make a difference, Egyed said. People need to know from where their food comes, he added. I hope it all goes well, my friend. Good luck! Crazy cool guy and box. And not too shabby an athlete, either!